How to fix “This site can’t be reached” error in Google chrome? Most people have no idea how to fix this error. Many people must have encountered this problem in Google chrome while opening some websites. It comes up with few more errors below this site can’t be reached. There are 2 more problems that you can see that are “DNS address could not be found” and DNS_Probe_FINISHED_NXDOMAIN are two more errors that are written below this error. The main cause of the error is that DNS look failed because web page is not available on the server. DNS or Domain Name System is the network service that translates a website’s name to its internet address. It simply means that whenever you type in a website address into the address bar of Google chrome then DNS service lookup its address (Hosting server). When hosting server is found then webpage becomes available and Google chrome opens the website for you. Why does “This site can’t be reached” error occurs? It mainly occurs due to poor internet connectivity or no internet connection or misconfigured network on your laptop, PC, Android or iPhone. Sometimes the DNS server of the website is unresponsive due to overload or maintenance then also you will get this error. It’s also caused due to not adding an exception in the firewall of your device for Google chrome or any other browser. Follow the steps below to restart DNS client in services of your computer. Press Windows + R to open RUN. You can also menu and search for RUN to open it. Type “Services.msc” and hit enter or click OK to open. Search for “The DNS Client Service” on right hand side. Right click on DNS Client Service and click on “Restart”. It will restart the DNS service. Now open website in Google chrome to see if this method fixed “This site can’t be reached” problem. Type “chrome://flags” in address bar and hit enter. Now scroll down and find an option called “Maximum TLS version enabled”. Click on drop down menu and select ” TLS 1.3“. Settings will be saved automatically. Close the browser and restart. Open the website that was giving error to see if this fixed the problem. Open control panel and click on “Network and Sharing Center“. Right click on active Network Connection and click Properties. Search for “Internet Protocol Version 4 (TCP/IP)“. Select it and click on Properties. Now you will see that “Obtain DNS server address automatically” is checked. Select “Use the following DNS Server addresses” put in the numbers shown. Put a check in front of “Validate Settings upon Exit“. Click OK and close. Now open website in Google chrome that was giving error. This method must have fixed the problem. Type chrome://flags in address bar of chrome. Scroll down till you see an option “Experimental QUIC Protocol“. Click on drop down menu and select DISABLE. It’s set to default. Right click on Windows button and select “Command Prompt (Admin)” option. Type following commands one by one and keep hitting enter after every command. Now restart your computer to see if it fixed the webpage problem. Press Windows Key + R. It will open RUN. Type “ncpa.cpl” and hit enter. It will open “Network Connections“. Right click on your active WiFi connection and select DIAGNOSE. It will open Network Troubleshooter. It will diagnose any problem with your network connection. It might give you an error “DHCP is not enabled for “Wireless Network Connection”. Click on “Try This Repairs as an Administrator“. Click on “Apply this Fix” on next window. Restart your laptop/computer and check to see if it fixed “This site can’t be reached” issue on Google chrome. Type chrome://flags/ into the address bar. Launch Google Chrome and open the troubled webpage and see if the problem is fixed or not. Open Device manager from My computer properties. Right click on your wireless network driver. Click on Uninstall and confirm again. Restart your computer and Windows will install default drivers for wireless adapter which can fix the problem for you. Right click on Wireless Network Driver. Click on “Update Driver Software“. Select “Search automatically for updated software“. It also searches online for updates drivers. You can select manual selection if you downloaded latest driver and want to update it. Reboot PC and see if it fixed “This site can’t be reached” error in Google Chrome. If you are unable to fix the problem using the above methods then you can uninstall the Google chrome from Programs and features. Download the latest version from Google Chrome website. Install it again to see if it fixed the problem for you. Final Conclusion: People followed above methods and successfully fixed their “Site cannot be reached” in Google Chrome or any other browser. Hopefully it will fix problem in your Computer as well. This entry was posted in Android Settings, Uncategorized, Windows Tips and Tricks and tagged 10 Ways to Fix "This Site Can't be Reached" On Google Chrome on March 29, 2019 by satyenhacks. Few of you must have encountered a situation where your iPhone Wi-Fi keeps disconnecting by itself. You have to connect to a wireless network again manually. People also toggle Wi-Fi option to connect again to their network. You can also toggle Airplane mode to connect to a known Wi-Fi network automatically. “iPhone Wi-Fi keeps disconnecting by itself” problem can be caused by number of reasons. However it can be fixed by making some changes in the settings. We don’t our iPhone or iPad Wi-Fi to get disconnected by itself. 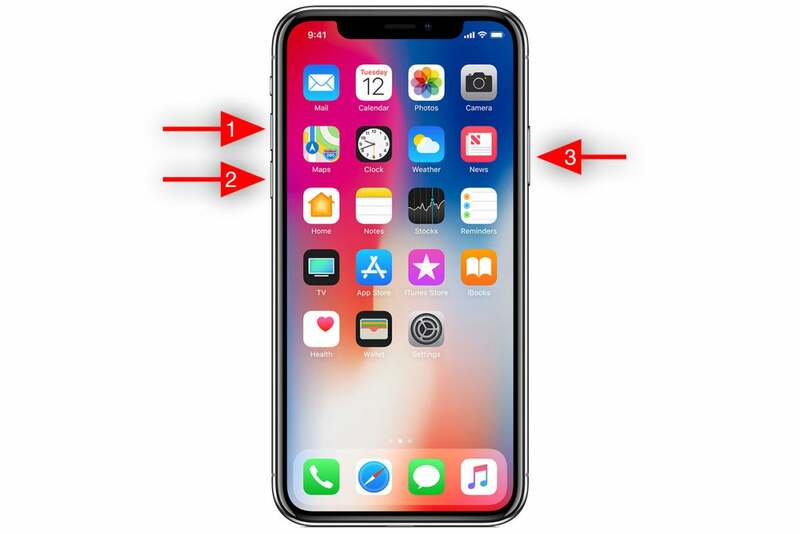 The iPhone Wi-Fi disconnection can be created by many problems such as poor signal, fluctuating signal, malfunctioning software on your device or may be the Wi-Fi receptor got damaged due to drop or exposure to liquid. Most of the above problems can be easily fixed beside the last one which is hardware damage. You should give the iPhone to a service center in case of hardware damage. The first thing that you should do when your iPhone or iPad Wi-Fi keeps dropping automatically is to check your network. The network might be creating all the problem. Take another phone or computer. Connect to the same Wi-Fi network that your iPhone is trying to connect. If your computer or phone is able to connect successfully then then problem must be in your iPhone or iPad. Make sure that your iPhone is in proper range of the network else the Wi-Fi network will keep dropping. You should also make sure that there is no device causing interference. Devices such as baby monitor or cordless phone can cause a great amount of trouble for some routers. Keep those devices away and connect to the Wi-Fi network and see if it improved the issue. The last thing you can do is to switch off the router for few seconds and turn it on. Now connect your iPhone to wireless network. Check if the iPhone stopped dropping Wi-Fi connection. Many times the biggest problems have easiest solutions to them. If you are having problem with the Wi-Fi network then this solution is one of the best for you. Open the Wi-Fi from status bar or go to settings. Turn OFF the Wi-Fi for few seconds then turn it ON again. Your iPhone will automatically get connected to the known network. Check for few minutes whether your iPhone or iPad is still having problem of dropping Wi-Fi network. Many iPhone and iPad users have reported that Bluetooth is causing problem with the Wi-Fi connection. Open the Bluetooth from settings. You can also open Bluetooth from status bar of the iPhone. Tap the Bluetooth to turn it off. Now connect to the Wi-Fi network and check whether the problem still exists or not. If the problem isn’t resolved then move on the next method. Go to “Settings” of the iPhone or iPad. Tap on little blue icon next to your Wi-Fi network. Tap on “Forget Network” option. Go back to Wi-Fi option. Search for the network. Now connect to the network with the right password. This solution has helped many people fix the automatic dropping of the Wi-Fi connection in iPhone and iPad. Wi-Fi assist is an option which is present in both iOS and android devices. Wi-Fi assist option helps your phone switch between mobile data and Wi-Fi connection when the Wi-Fi connectivity is poor. If your iPhone is dropping Wi-Fi signal then it may be because of Wi-Fi assist. The network connectivity might be poor at your location. Your phone will keep switching between mobile data and Wi-Fi. When Wi-Fi connectivity will get better then it will connect your phone to wireless network. You won’t like this thing. We always want either mobile data or Wi-Fi to work continuously rather than keep switching. Go to “Settings” of your iPhone. Keep on scrolling down until you see “Wi-Fi Assist” option. Disable the setting by sliding the button to the left. Now it will stop switching between mobile data and Wi-Fi that will also resolve your Wi-Fi issue of keep disconnecting. Most of the network related problem in your iPhone and iPad can be easily fixed by restoring the network settings. Network settings reset will remove previous settings of Wi-Fi, Bluetooth and cellular settings which will help you get rid of problems. You can start fresh and enter new settings that can work perfectly. Don’t forget to remember your networks and their passwords because they will be wiped off during the reset. Tap on “Reset Network Reset” option. Enter your passcode and follow the next steps to reset. Restart your phone and connect to the wireless network. Keep checking whether the problem got resolved or not. If the Wi-Fi dropping still exists on your iOS device then proceed to the next step. Go to “Settings” of iPhone. Tap on “Wi-Fi” and switch it ON. Connect to your desired wireless network. People have claimed that it fixed their Wi-Fi issues such as dropping of Wi-Fi signal every now and then. You must try out this technique and see for yourself whether it’s working or not. Changing DNS servers of the wireless network has also helped people get rid of the problem. You can change the wireless network DNS servers to one of Google servers or open DNS servers. It will help your iPhone get rid of “Wi-Fi keeps disconnecting” issue. Go to “Settings” of iPhone or iPad. Tap on “Wi-Fi” option at the top. Tap on little blue icon next to the connected wireless network. You will see that under IP Address >> DHCP, DNS servers are located with some random IP address. Note down the current DNS used. Click on the DNS server address and it will become editable. Enter “8.8.8.8, 8.8.4.4” for Google’s DNS or “208.67.222.222, 208.67.220.220” for Open DNS. Go back to Wi-Fi and let the it auto connect. Many iPhone users fixed their Wi-Fi problem by changing the DNS servers like this. If it didn’t help you out then you should change back DNS to the previous IP address that you noted down. Renewing DHCP lease has also helped people in solving their iPad or iPhone disconnecting issue. You must try out this option to see whether it works for your network or not. Scroll down and click on “Renew Lease” option. A pop will appear. Tap on “Renew Lease” again. It will renew the DHCP lease. If you recently updated your iPhone or iPad to a new iOS or installed some new features through update feature then there is a chance that problem is being created by the new update. People who have upgraded to iOS 11 from iOS 10 complained about many problems regarding Wi-Fi networks. It was because of the upgrade. If you upgraded and experiencing Wi-Fi disconnection issues because of the software update then you should wait for the next update. Most probably the new update will fix the issue of dropping Wi-Fi connection. Hardware issues can become a real time headache as they will cause a long term damage to your iPhone until your repair it at the Apple service center. If you dropped your iPhone or iPad or if it got exposed to liquid then you started experiencing problems in your Wi-Fi connection or any other things then you must take your phone to service center. They will fix the issue. Hardware issues should not be handled by yourself. Most probably one of the above solutions will help you fix “iPhone or iPad Wi-Fi keeps disconnecting by itself”. If you found any other method then comment below so that we can include the same in our list. This entry was posted in iPad Wi-Fi Settings, iPhone Settings, Uncategorized, Wi-Fi Connectivity Issues on January 10, 2018 by satyenhacks. Many iPhone users are reporting that their Wi-Fi automatically turns ON by itself. The automatic turning ON of Wi-Fi causes a great amount of battery drain specially for old iPhone users. Wi-Fi turns on automatically even after iPhone users are turning it off from Control centre given on iPhone. The last thing you need to know is that it’s not a problem with the iPhone. it’s not even a bug. It’s a hidden feature provided by the Apple in their latest operating system iOS 11. You will find that Wi-Fi turns on by itself if you recently updated your iPhone or iPad to iOS 11. You can easily turn off this setting in your iPhone. We are going to tell you few methods so that you can easily resolve automatic turning on of your Wi-Fi on your iPhone or iPad. We are going to list few things which will help you out in resolving the iPhone Wi-Fi issue. You can follow the below method to completely turn off your Wi-Fi to prevent it from automatic toggle. Tap on “Software Update” option. It will now show “Checking for update“. If any new update is available then you should download and install it immediately. New updates will fix many bugs of previous iOS. It will also fix common issues related to Wi-Fi connection. Many people have fixed their Wi-Fi automatic turn ON issue after software upgrade. You can also downgrade your iPhone or iPad iOS by doing a factory reset. However you will loose all the apps and settings which you have saved on your iPhone. Save all the important data on your Macbook or some hard disk. Perform a factory data reset on your iPhone which will fix all the problem caused by iOS 11. It will resolve “Wi-Fi turning ON” problem. The new control center given in the latest iOS 11 has different functionalities. Features will look same just as in old ones where you can toggle Airplane mode, Wi-Fi toggle, Bluetooth toggle along with many other options. However you must know that Wi-Fi toggle and Bluetooth toggle don’t completely Turn OFF the Wi-Fi. They simply disconnect your iPhone or iPad from current wireless network. It’s one of the things that many people are unaware of. They simply toggle the Wi-Fi button from control center. They are thinking that it turned off the Wi-Fi completely. However it doesn’t. You need to switch off the Wi-Fi from settings of the iPhone. It will make sure that Wi-Fi doesn’t turn on automatically by itself. Tap on Wi-Fi button to switch off the Wi-Fi completely. Settings >>> Tap on Bluetooth >> Turn OFF Bluetooth. You turn on Wi-Fi again from Control Center. You connect to a Wi-Fi network manually through settings. You go to a new location. People have reported that their Wi-Fi automatically turns ON at 5 AM local time. So when you turn off Wi-Fi from the control center and you wake up in the morning after 5 AM then you will find your Wi-Fi turned ON. People get confused over this and they think it’s automatic. The reason behind this is that it’s programmed into the new iOS 11. The last thing you need to do is go to iPhone Settings, tap on Wi-Fi and turn it OFF. It will fix the iPhone Wi-Fi automatically turns on by itself issue. This entry was posted in iPad Wi-Fi Settings, iPhone Settings, Uncategorized, Wi-Fi Connectivity Issues on January 9, 2018 by satyenhacks. Sometimes the wireless network in our iPhone and iPad creates a lot of problem. The Wi-Fi network has problems like getting stuck, won’t turn on, authentication problems, IP address conflicts and obtaining IP address issues. All the Wi-Fi connectivity problems can be easily resolved by resetting the network settings on your iPhone and iPad. iOS has direct way of resetting the network settings. You just have to follow the simple steps mentioned below to reset the network settings on your iPhone and iPad. The “Reset Network Settings” in iPhone and iPad will reset Wi-Fi networks and passwords, APN and VPN settings along with Cellular settings and bluetooth settings of the phone. You should note your desired networks password somewhere if you don’t remember it. Resetting the network will delete all saved networks and their passwords. It will also fix cellular problems such as “No Service” and “Searching on your iPhone and iPad”. Go to “Settings” app on your iPhone or iPad. Select “Reset” option inside it. 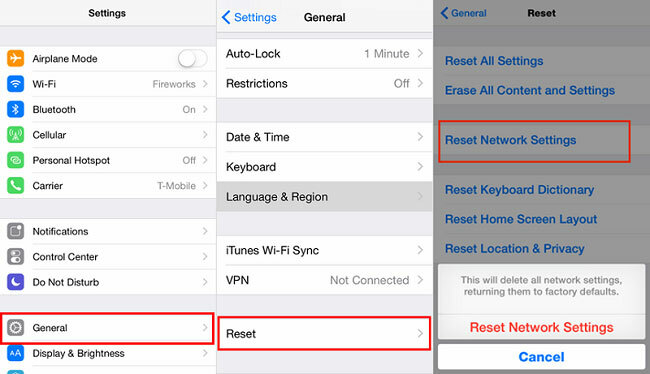 Click on “Reset Network Settings” to change all network settings to default on iOS device. You can use these options to fix many problems when required on your iPhone and iPad. The reset network settings methods will work on all variant of iPhone and iPad such as iPhone 5, iPhone 6, 6S, iPhone SE, iPhone 7, iPhone 7 Plus, iPhone 8 and iPhone X. There are many issues which arise on iPhone due to network issues. These problems can be easily fixed by simple methods. Let’s have a look at these issues of iPhone and iPad. Wi-Fi stops working – If the iPhone or iPad Wi-Fi stops working then you should perform the above mentioned steps to resolve it. Resetting the network will surely fix the Wi-Fi won’t work issue in no time. You should also read this “Wi-Fi Won’t Work Guide” to fix it. Unable to Connect to Specific Network – If you are unable to connect to one of your favorite wireless networks then you should press and hold the network. You will get two options “Forget Network” and “Modify Network”. Click on Forget Network option. Now search for network. Connect to it again with the right password. Most probably it will fix the issue. If it doesn’t then you should perform a network reset on iPhone or iPad. No service or Searching for Network – There are times when iPhone or iPad takes a whole lot of time to search for a network and finally says No service at the right hand top. This problem can be easily fixed by switching ON Airplane mode and turning it OFF after few seconds. If it doesn’t fixes the issue then you should perform network reset option. Problems with Making or receiving calls – If you have problems in calls then it’s because of the accidental switching on of Airplane mode. Turn it off and you will be able to make calls again. If it does’t help you out then restart your iPhone or iPad. If it also doesn’t help you out then perform a network reset option which will surely fix the issue. iMessage isn’t working – iMessage isn’t working is a very common problem in iOS devices. It won’t let you turn off iMessage as well. In such cases the network reset option will also not help you. You can try. Instead of reset network option, you should try hard reset option which is “Reset All Settings” on your iPhone or iPad. It will fix all the issues. Don’t forget to save all the important data before you perform a hard reset on your iPhone or iPad. iPhone Could not be synced – This is yet another common problem among iOS users which can be easily fixed by rebooting and performing a network reset option on your iPhone and iPad. It will resolve the issue very easily. I already wrote about how to reset network settings on Android phones. If you have any Android phone then check the Android reset network settings guide as well. If you are having any problems related to Wi-Fi on Android then read out “Wi-Fi Connection Fix Guide“. If you know any other method to reset network settings on your iPhone or iPad then do let us know in the comments so that we can list it above. This entry was posted in iPhone Settings, Uncategorized, Wi-Fi Connectivity Issues and tagged Reset Network Settings on iPad 2018, Reset Network Settings on iPhone 2018, What Does Reset Network Settings Do on iPhone or iPad, What Happens When You Reset Your Network Settings on iPhone on January 5, 2018 by satyenhacks. There are times when your Android phone gets connected to a wireless network successfully but when you try to access the Internet then it shows no Internet access in your browser. You will encounter “No Internet Access” on many android devices and tablets. It’s a common issue that you can resolve easily by following few simple troubleshooting methods. “No Internet Access” error can appear due to multiple reasons. Your Android phone or tablet and router both can cause this problem. Most of the time people think it’s because of their phone however there is a chance that problem lies at the router end. You should look for solution at both ends to fix no Internet access error on your phone or tablet. We are going to tell few methods that will troubleshoot your wireless network on Android phone and tablets. Follow them one by one to fix your Wi-Fi issues. The most common problem to No Internet access is the Wi-Fi network itself. It’s not an issue with your Android phone or tablet. You may have seen other mobiles and computers connected to the same network and accessing the Internet. Still it can be network related problem for your Android phone. In order to find more related to Wi-Fi network issues, connect your Android phone to some other Wi-Fi network or Hotspot and try to browse the Internet. If you are able to successfully browse the Internet from other Wi-Fi networks then for sure “No Internet Access” problem is related to your wireless network. Network is getting connected but is giving no Internet access to your Android smartphone or tablet. You can do few things mentioned below. The easiest solution to the above problem is to restart your router/modem that will refresh all the network settings. Resetting the router will help your Android phone to pick up new settings and you will be able to browse the Internet properly. Restarting your router/modem also makes sense when your Android phone lost getting Internet connection suddenly. In order to reset your router/modem, simply unplug the power cable for few seconds and then plug it back into the supply source. It will take few minutes for the router to boot up. Connect your phone to the Wi-Fi network and check if the Internet is working or not. Enjoy the Internet if it’s working fine or move on to other troubleshooting methods mentioned below. Now we will look into the issues created by Android phone or tablet. If the network reset didn’t work for you then you should perform a soft reset on your Android phone or tablet. Soft reset simply means to restart your android phone. Turn off your Android phone entirely and turn it ON again after 1 minute or so. Now connect to the Wi-Fi network and see if it started working or not. Most probably it will start working and won’t cause any problem. If it didn’t help you then you can take out your battery while the phone is switched ON. Insert the battery after few seconds and turn it back ON to see if Wi-Fi network started giving you Internet connection. Newer phones don’t offer the option of taking battery out. One way or another you have to boot up your phone that will help you fix many problems beside “No Internet Access”. People don’t tend to look at their default homepage. Sometimes you install some software on your phone and it changes the default homepage of the browser to some other website than Google or Yahoo. When you open your browser then the homepage shows “No Internet Access” or “Web Page Not Found”. Now it’s the problem of the website that browser is trying to load. It may not be working or it may not be loading at all. To remove any kind of doubt, open the Google.com in a separate tab in your browser. If it opens successfully then your Internet is working totally fine and it’s the homepage that is not loading making you believe that Internet is not working. The easiest solution to this problem is to change your browsers default homepage to Google instead of some random search engine. Sometimes few apps can cause multiple problems in our Android phone. These apps will change many settings inside without us knowing. If you have installed any application in the last few days after which the No Internet issue started then you should uninstall the application right away. Uninstall the application. Boot up your phone. Connect to the Wi-Fi Network and see if Internet started working again or not. This is yet another technique that is very useful in solving Wi-Fi related issues. It can solve your “Connected but No Internet” problem. We have the habit of saving known networks in our phone along with their password so that phone can get connected automatically when the Wi-Fi network is in range. However if there is a change in the network then it causes no Internet problem. In such cases you should forget the network on your phone and connect to it again. Go to “Settings” of your Android phone or tablet. Press “Wi-Fi” option under the connections tab. Look for the Wi-Fi network that you are trying to connect. Tap on the network (Tap and hold for few phones) until you see “Forget or Forget Network” option. You could also see modify network option in many phones. Go to Wi-Fi and Connect to the Wi-Fi network and see if Internet started working or not. You should check security application in your phone because sometimes these security apps can create problems in browsing the Internet. There are many types of security applications such as firewall, antivirus, virus scanner etc… If they are blocking the Internet then you should create an exception regarding the same. If you are unable to figure out the problem in settings of the security application then you should uninstall the applications and then try to access the Internet. If it starts working then certainly the problem was with the app that you uninstalled. Install any other anti-virus or virus scanner app or wait for a better update of the same applications. You should also search for options on Google as the problem can be caused by a simple check on certain options. Whether you know or not but date and time make a big difference on the network. You will get connected but with no Internet access. The date and time on the router, modem and mobile should match with the date and time of the ISP. If there is a difference then your Internet won’t work as expected. Try to resolve the issue by calling customer care of the ISP. Go to “Settings” of Android phone or tablet. Press and hold the wireless network that you were trying to connect. You will get two options: “Forget Network” and “Modify Network”. Select “Modify Network” option. Make sure show advanced settings is selected. Under “IP settings” select “Static” instead of DHCP. Now complete the empty fields according to your network configuration and click on save. Your network will get connected and you will be able to browse the Internet successfully. You can also try an app called “Wi-Fi Static” through which you can manage and configure static IP directly. You can download Wi-Fi Static app from play store. There are number of apps on the play store which can help you resolve all the issues related to Wi-Fi connectivity. Normally I don’t suggest apps to fix any problem on Android phones as they can cause even bigger problems or add more to existing problems. Try to follow all the methods given above. If they don’t help you then you can install the below mentioned applications to fix connected but no Internet problem. Wi-Fi fixer app will analyze all the data and it will fix your Wi-Fi problem. You have to be patient as it may take some time. There can be multiple problems with your Wi-Fi. You can follow the below links to make sure that your Wi-Fi works perfectly. Hopefully after following all the methods you will be able to fix your No Internet issue while connected to Wi-Fi. If you know any other trick to fix such issues, do tell us in comments. This entry was posted in Android Settings, Uncategorized, Wi-Fi Connectivity Issues on January 5, 2018 by satyenhacks. “Wi-Fi not connecting” on the phone is a major problem for many people. There are multiple reasons as why your phone Wi-Fi won’t connect to your router or any desired network. Most of the time the WiFi problem can be easily fixed with few simple steps. Sometimes it can be really annoying as connection problem continue to exist even after following many troubleshooting methods. You should first follow the simple methods then head on to apply advanced methods to fix your wifi won’t connect problem. WiFi connection failure is a common problem in Android phones as well as on iPhone. The failure of Wifi connection problem exist in many forms such as authentication problem, Network not in range, can’t connect and sometimes the WiFi button won’t even turn on. It Wi-Fi will get stuck on turning ON in Android phones and tablet. I am going to tell you few easy methods that you can follow to fix it. It will take few minutes to remove your problem from the root. If your Wi-Fi still doesn’t work after following below steps then you should head over to advanced troubleshooting methods. You can toggle Wi-Fi button from your settings or notification area. The Wi-Fi setting is available in both Android and iPhone inside the settings. The direct Wi-Fi button is available in the notifications area which you can open either by swiping at the top or bottom of the phone. You can ON/OFF Wi-Fi from both areas. Switch off the WiFi and Switch it ON after few seconds. Doing this solves the problem most of the time. If you network is saved then it will get connected automatically otherwise you can select the network in the WiFi settings and click on connect. Many users have found this method really helpful. You can toggle Airplane mode in the same way as WiFi. Airplane mode button is available in settings as well as notifications area. Switch off the Airplane mode for sometime and then turn it back ON. Airplane mode is really helpful for this problem. It fixes WiFi and data connection problem most of the time. If you are not getting proper data connection on your mobile network then you can try this method. It will search for the mobile as well as WiFi network connection after switching it on. Many people have found this thing very helpful. It is one of the best fixes of WiFi won’t connect problem. Sometimes the problem lies at the other end of the network causing the failure of Wi-Fi connection on the phone. In such cases you can try restarting the Wi-Fi network by restarting the router or by restarting the Hotspot network on other mobile or laptop. Many times the problem will be fixed immediately and your phone will get connected to Wi-Fi automatically. Your Android Wi-Fi will start working again. If it doesn’t help then you should proceed to the next method in this tutorial. Incorrect password is one of the biggest problem for people. They tend to forget the right password or change the network password and keep entering the previous password in their phone. It will continue to show wrong password for the network. This isn’t a problem with your WiFi network. Your phone or laptop wifi won’t connect with wrong password. You should enter the correct password with all the case sensitive letters and numbers along with symbol keys. It will surely fix the wrong password problem and you will get connected to WiFi network in no time with right password. You should also check for the capslock button on your phone and laptop. ON capslock is also a common problem for many people that people don’t realize. Find Wi-Fi connection settings. It will depend upon your phone. Sometimes you will find it under “Connection” or directly in the settings with the name “WiFi connection”. All saved WiFi networks will be shown here. Tap on it and click on Forget. Now search for Wi-Fi networks. Once your network is shown then you can click and connect it with the right password. Forgetting the network is really helpful, as it will delete all previous settings related to the network that you used to connect. It will surely troubleshoot Wifi problem in Samsung models such as Galaxy 2, Galaxy 4, Galaxy 8, Galaxy 7 etc… If you will follow the method above then your android and iPhone WiFi will start working again. You need to make sure that you are trying to connect to the right network in your list. Sometimes you may find WiFi networks with the similar names. You may be trying to connect to the wrong network in the list. Even after entering the right password in the wrong network, your Android phone won’t connect to it. Double check to make sure that you are being connected to the right network. Power saving mode of the Android and iPhone helps consume less battery. However power saving mode sometimes becomes a major problem for the Wi-Fi that people don’t realize. WiFi drains the battery quickly in most of the phones. Power saving mode disconnects Wi-Fi in few Samsung phones. It was found that in many Samsung phones the power saving mode interrupted with the Wi-Fi network connection when it returned from sleep. Such users have to ensure that power saving mode is turned off. It has been found in many devices that Bluetooth creates a problem with the wifi network. The Wi-Fi doesn’t work when Bluetooth is turned ON. You can make your wifi work again by switching off the Bluetooth. Switch it off and then try to connect again to the WiFi network connection. You can switch off the Bluetooth from notifications area or settings>>Connection or Bluetooth>> Turn off. Everyone knows that restarting your phone solves most of the problems in your device. You can restart your android phone or iPhone to troubleshoot any problem in your phone. It will also troubleshoot WiFi won’t connect problem. Simply reboot your phone. Switch it on. Now try to connect to the Wi-Fi network that you were trying to connect earlier. Most of the times it will get connected successfully. You can try restarting your Android phone, Android tablet, iPhone and iPad. It work successfully in all the devices. Most of phone and tablet problem can be easily fixed by doing a data factory reset. Data factory reset will delete all the settings and data on your phone. All the apps, software and settings will become just like new phone. Data factory reset is one of the major troubleshooters to many problems. You should save all your data and documents before your do a data factory reset on your phone. You should search for data factory reset option in your settings>>phone settings or under security. It depends on phone to phone. Find out the option in your Android phone/iPhone/iPad. Hopefully these 10 troubleshooting methods will help you in solving your wifi problem. Your Wi-Fi will start working again and you can browse your favorite websites on the Internet. This entry was posted in Uncategorized and tagged Fix WiFi Connection Failure on Android, Fix WiFi Failure Connection on iPhone and iPad, Fix WiFi Not Connecting on iPhone, Fix WiFi Not Connection on My Android, Fix WiFi Not Connection on My iPad, Fix WiFi Won't Work on iPad, Fix WiFi Won't Work on iPhone, Fix WiFi Won't Work on My Android, Why Is My WiFi Not Working on My Phone on January 1, 2018 by satyenhacks.